“I think that creating balance for agility dogs and handlers is very important. Balance not only in agility training itself, but also away from the agility field”, says Renee Prinsloo, an agility coach and international level competitor from South Africa. What does balanced agility training mean? Renee thinks that balance is just as important off the agility field: “Dogs need to have a break, not just at the end of the season, but in life in general. As people, we work and have hobbies to help mitigate some of the unavoidable stress of life and I believe dogs similarly need a break from training. During the break you can go for walks or runs where your dog can smell the flowers so to speak.” Renee says she has noticed that when she gives her dogs such opportunities, they are all the more eager to work, even the one who loves agility more than anything. A new trend makes its way onto social medial and then that becomes the only way to do a specific thing until something new pops up. Often handlers don’t consider if this is right for them and their dogs, and if it fits in with their lifestyle and their agility goals. I love following the best of the best in the agility world on social media and learning from them and being inspired: it’s what pushes us forward. But often on social media you only see the success and not the time and effort that went into it. I have often found that students get so excited about getting something right that they forget to move on and get stuck, eg: They are so excited that their dog can now do 12 weave poles that they forget to start proofing and challenging the skill further. Some people think that because they have trained a certain skill in agility and they have managed to do it well, they don’t need to practice that skill anymore. Over time you can see the skill deteriorate until that skill is almost zero and has to be retained. If you keep the balance in training and don’t neglect or over train a skill, competing just becomes so much easier. I think if you don’t plan your training, you are setting yourself up for failure. Just as different people have different personalities, people are also different in how they are able to plan. Some people are able to have a plan in their heads, remember it and still be able to balance their training - others have to write things down. Neither is right or wrong as long as both lead to a balanced training session. AgiNotes makes this part simple for those who like to, or have to, have things on “paper”. It also helps those that are more visual by providing graphs, and you can easily see if you are heading for an extreme or if you are staying balanced. “Einstein said “Life is like riding a bicycle. To keep your balance you have to keep moving”. This is what I believe is true for agility as well. Each person is different in what they like and how they work. The best advice I can give is to try different things, find out what you like and what works for you. Some people like to use digital tools, others a notebook and pen; some like to go for trail runs with their dogs, others prefer to do treadmill work; some go for AWC whilst others prefer to be weekend warriors. Whatever you decide, make sure it fits your lifestyle and works for your dogs. And have fun with it! Success doesn't just happen - there’s so much you can't see. You should never compare you or your dogs with others. Instead, set your own goals, make individual training plans and then, give your 100% in every training session. This will really make the difference. 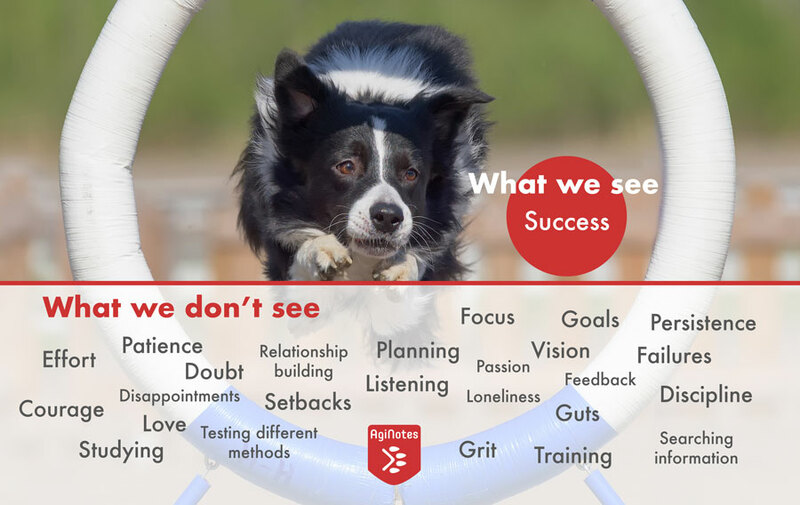 Try AgiNotes to help you get individual data of your performance and with the help of that, make good plans and train wisely to become the best version of you and your dog as a team. Older PostNew release out now!